"Word on the industry’s rumor mill is that the brand is on its way out, with sales slumping and customers uninterested...The sources we spoke to all pointed to the same reasons for the brand’s slump in sales: recent collections offered no new ideas and largely consisted of reissued or reworked pieces from previous seasons, while prices were too high for the quality offered. Customers were instead moving on to Gvasalia’s Balenciaga collections, which offer the same look for better price and quality." "'From a retail stand point, Vetements is completely dead,' said another [buyer], who works at an independent North American multi-brand retailer. 'Over the course of two seasons no one is even looking at it. Sales have dropped dramatically to the point where you are now seeing Vetements on sale on various outlets at 60-70% off.'" Quite the sartorial saga, no? Now that we're caught up, let's move to the interesting part: namely, why does this story matter and what does it say about the state of fashion today? I have to start by saying this: Vetements has confounded me from the start. It's a brand I partly don't get, partly admire, and partly see as a manifestation of everything that’s wrong with fashion today, all at the same time. If that's not confusing enough, I have spent the last five or so years consciously distancing myself from the zeitgeist in fashion so that I could learn to define fashion for myself, separated from all the forces that try to define it for us. That I'm deliberately not plugged in makes it even harder for me to understand precisely what it is that makes Vetements so incredibly relevant to fashion culture. But that in itself is so telling, right? 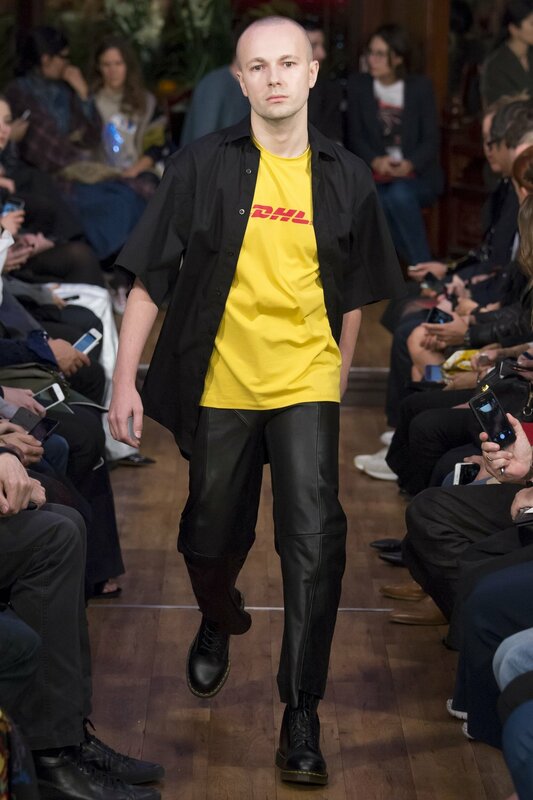 Vetements is only relevant if you're tuned in to the hype. And I think that's what this is all about: hype and the role hype plays in fashion today. In the last few months, the passing of Azzedine Alaïa and Hubert de Givenchy forced me to think critically about how and why fashion has changed in the past few decades. Fashion has always been about using a piece of clothing to capture and translate into physical form something that exists in the air—a feeling, an idea, the way a society is changing, the things we want, and the ideas we value. But fashion, at least historically, always came back to the clothing: how clothes were made, their construction, the fabric, the fit, the spark of underlying creativity, the artistry and the craft involved. Kanye West and Chiara Ferrangi wearing Vetements hoodies. Images via Getty. That is not so today. Today, fashion is about hype. And hype doesn't necessarily equate to how good the clothes are. Sometimes it does, but often it doesn't. Divorced from the merits of a physical garment, hype becomes a different beast altogether—one that derives from public perception and influence and a hard-to-pin-down cool factor and cultural forces and people's attention span, and so on and so forth. In contemporary fashion culture, hype has to do with so much, really, except, ironically, the clothes. The article in Highsnobiety was so dangerous to Vetements because Vetements is a label built on perception; hype is their brand. Take away the sense that other people think Vetements is hot, and it isn't hot anymore. And just like that, Vetements is over. Precarious, no? Hence the forcefulness of the brand's response. Again, it's ironic. The very zeitgeist that made Vetements what it is could make it irrelevant in the same blink of an eye. All of this leaves me questioning: who benefits from a fashion industry built on hype? I don't think we benefit, as people who buy clothes, because of the disconnect between hype and value. If the most buzzed-about brands aren't necessarily the ones making the best clothes, how can we learn to disentangle signal from noise? People who make clothes don't benefit either, in the long term at least, because no matter the case hype is bound to come and go. And when it goes, all brands are left with in the end is a skewed sense of what customers value. Yes, the industry as a whole sells more clothes. But when fashion yields to hype, does it serve its purpose? Does it serve to inspire us? Does it serve us? Does it enhance our lives in the way fashion is meant to? I think it doesn't, which is ultimately why a fashion industry that deals in hype is a disservice to us all. Instead, it is the fashion that must come first. The hype can follow, but it doesn't have to. Good clothes are good enough.